As a YA blogger I start a lot of series. 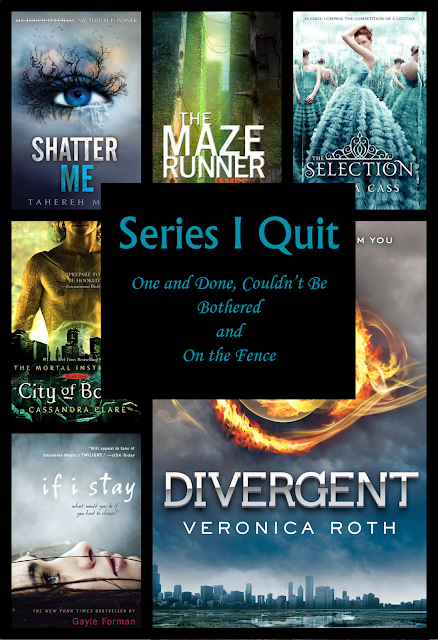 There are just a lot of series out there, but some of them end up not really being for me. Sadly, this is just a small sampling of the series I quit for one reason or another. All the series in this post are complete (with the exception of The Selection), so technically I could finish them, if I felt so inclined. Go ahead and cheer for your favorites. Tell me I'm crazy. Let me know what I'm missing out on. The Shatter Me Series: I know so many people that loved this series, but I just didn't really like the first book very much. The plot felt kind of fuzzy to me, and the clipped writing style just wasn't for me. The Maze Runner: There were just too many things about this book that bugged me. Thomas' near-constant mentioning of his highly subjective memory-loss got old. I really don't like when suddenly, inexplicably returning memories solve mysteries. Forest of Hands and Teeth: I was really looking forward to this book and then found it sadly disappointing. I had a hard time really connecting with the characters, including Mary, even though the novel is written in first person. I found Mary to be rather selfish and her dream of the ocean to be kind of odd in the face of all danger she faced. The Divergent Series: Yeah. So I read the first book in the Divergent series, and I thought it was okay but not fantastic. A year went by and Insurgent came out, so I picked it up from the library. I read a chapter or two and then just couldn't be bothered to finish. In Divergent's defense I was going through a whole "I'm over YA faze." And I really liked the movie. It made me want to know what happened next. Apparently not enough to pick up the book, however. The Matched Series: So, I really liked Matched, despite it's mixed reviews, but Crossed completely did me in. Ky and Cassia's voices sound exactly the same. I kept having to look back to the chapter heading to see who was talking. Plus, wasteland wandering. I never picked up Reached. The Mortal Instruments: It seemed like everyone in my little circle was really into this series. I read the first two in the series and didn't find the twists particularly surprising. I think I quit reading the series mostly because it's just so long. I mean, six books that are like 600 pages each. It was just too much for me. The Selection Series: I read all of the books in Kiera Cass's Selection Series, The Selection, The Elite, and The One, but America was starting to bug me so much by the end of the third book that I'm just on the fence when it comes to The Heir. The Lumatere Chronicles: I really liked the first book, Finnikin of the Rock, in Melina Marchetta's fantasy series. However, it was dark, a little difficult to get into, and a pretty hefty investment. I guess I just can't decide if it's worth it to fork out the effort two more times. If I Stay: It seems like everyone loves If I Stay, and I just thought it was okay. (I know, boo.) I liked it well enough that I thought I would maybe read the next in the series. I think I might have even started it at one point. Maybe I will pick it up again. Maybe.